In my travel the most exiting thing is to visit the new places (на которых еще не бывал) I visited 131 out of 192 United Nations listed countries, more then 3/4 of them. So now I have to visit mostly the same old places. My last trip (Nov 7 - Dec 20) was in Yucatan, Mexico. In spite of the fact that I visited it many times before, I found some new and interesting stuff on which I will report to you in this TN. I flew to Cozumel and stay at Amigos hostel http://cozumelhostel.com/ for $10 per night. The owner, Kathy feeds guests with pancakes in the morning and sometimes with a very tasty cake in the evening. There are many fruit trees on the property. 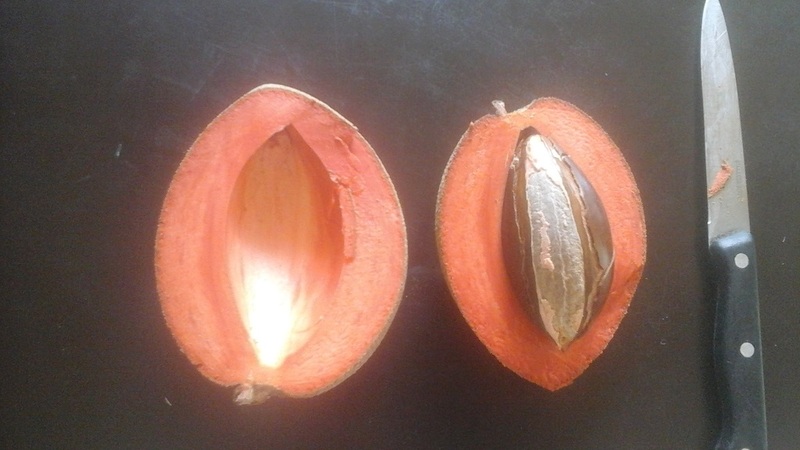 I like fruits of Sapote (Mamey) tree. They have delicate and unusual taste. 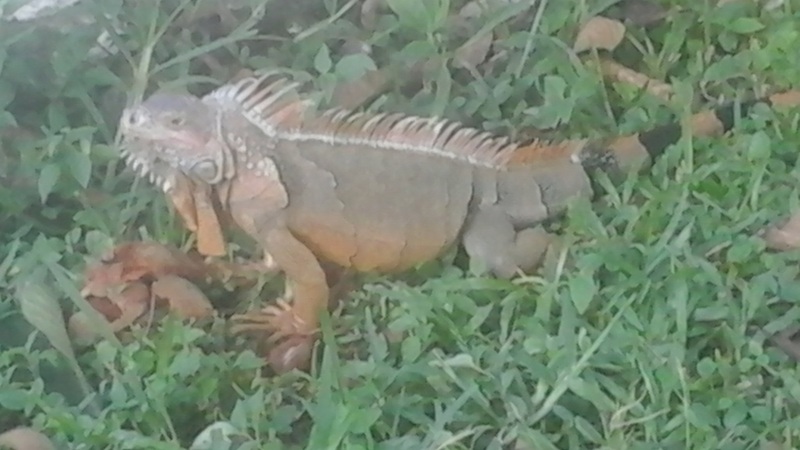 The only creature who share my sympathy for this fruits was resident iguana. 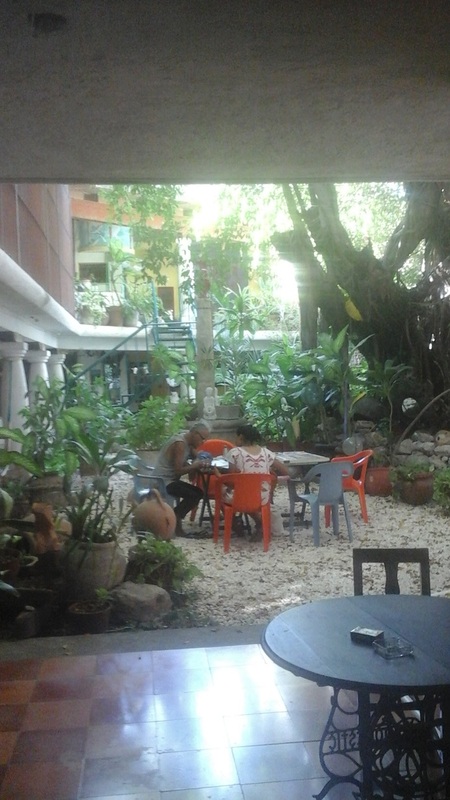 Young backpackers who stay in this hostel prefer fruits from supermercado. Like everywhere on Caribbean, the seashore is occupied by hotels, all inclusive resorts and luxury condominiums, standing shoulder by shoulder. So the person who is not affiliated with them does not have access to the sea. 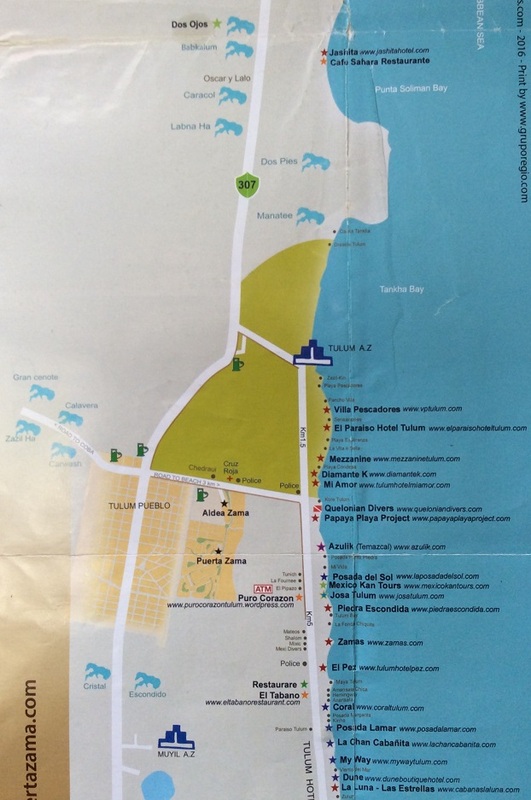 However, if you will go from the town center to the South along the shore, then after a while, it will be some space between these monsters, where you can get to the sea for some snorkeling and even spearfishing. Precisely, after Presidente international Hotel and before Chan Kanaab Park there are three such spots, which looks like small pedestrian path leading from the main road to the sea. 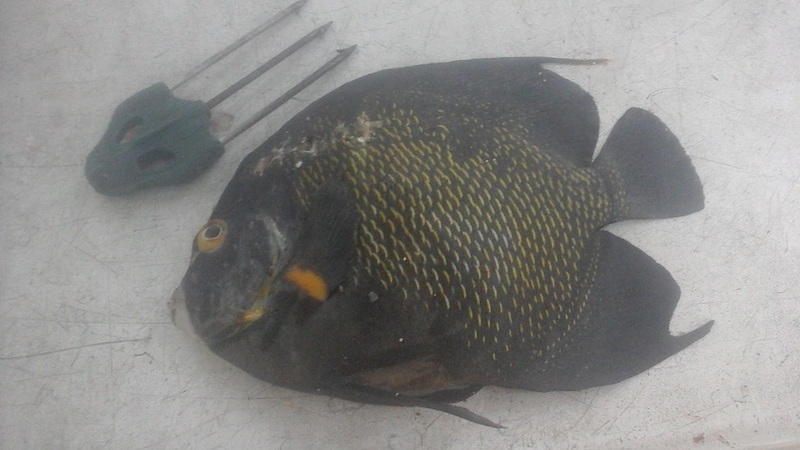 They are hidden enough to make small fire in order to bake fish you caught. Previously I carried a mug to make a fish soup. Now I found it is simplest to put entire fish on fire for 8-12 min, that's it. You need a bicycle to get there, as it is about 10 km from the town. 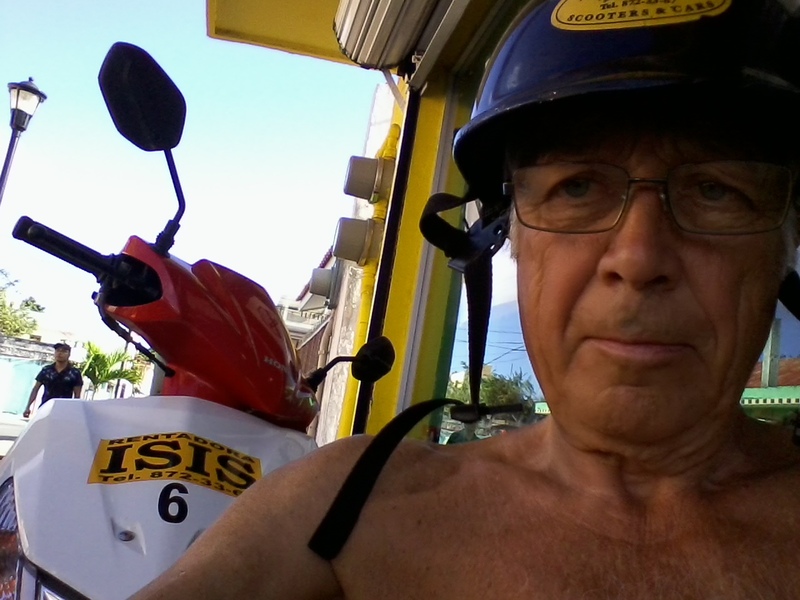 One day I rented motorcycle from the company called Rentadora ISIS-? and rode it around the island. From Cozumel I went to Tulum and stayed in legendary hostel Weary Traveler http://wearytravelerhostel.com/ for $8. They provide ingredients for self served breakfast and dinner, and also give free caipirinha every night. I stayed there for few days and visited some senotes. 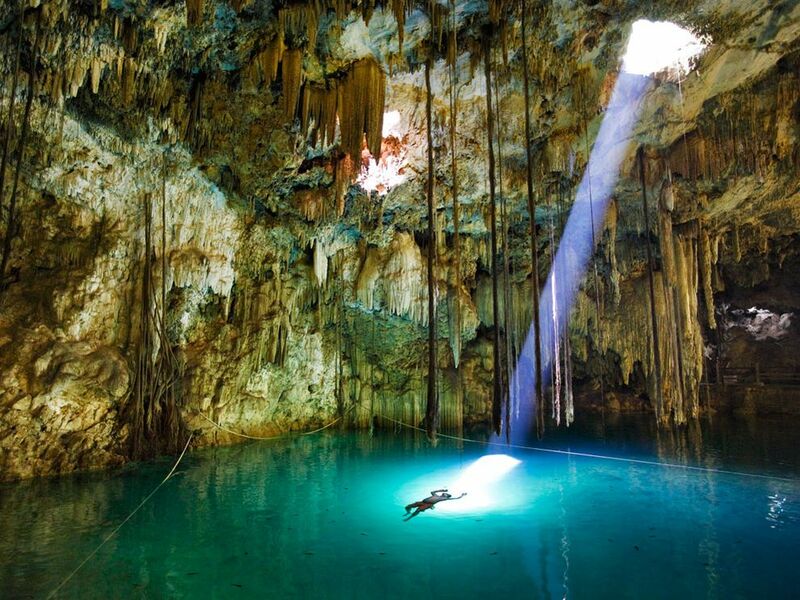 Yucatan peninsula is a gigantic slab of limestone. 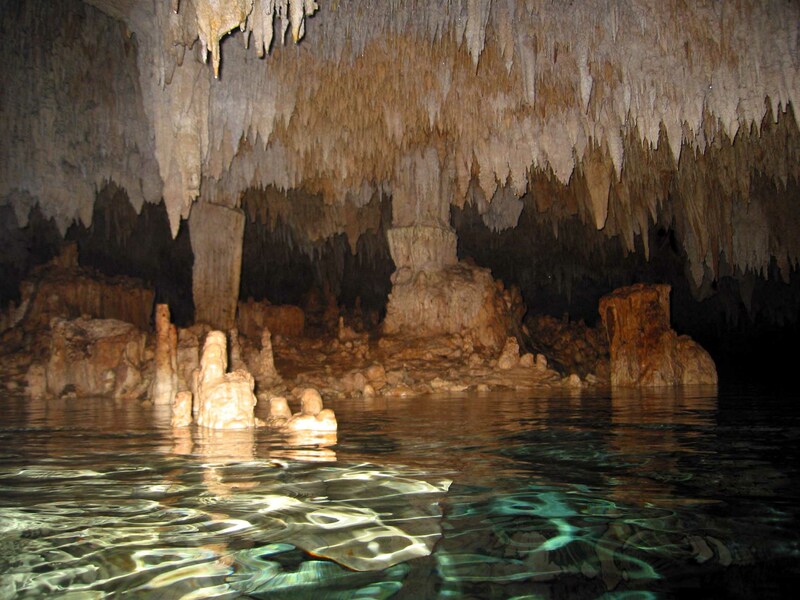 Water erosion transformed it to something similar to Swiss cheese with underground rivers, lakes and submerged and semi submerged caves, called senotes. Some of them are civilized, with changing booths, toilets, entrance fee and busloads of tourists. Some senotes are staying in their natural conditions. I tried to find these "wild" senotes. It is now possible to locate them with navigation systems on smartphone, such as google map or maps.me. It was a little bit like playing pokemon. Tulum is surrounded by senotes ( see map in attachment). 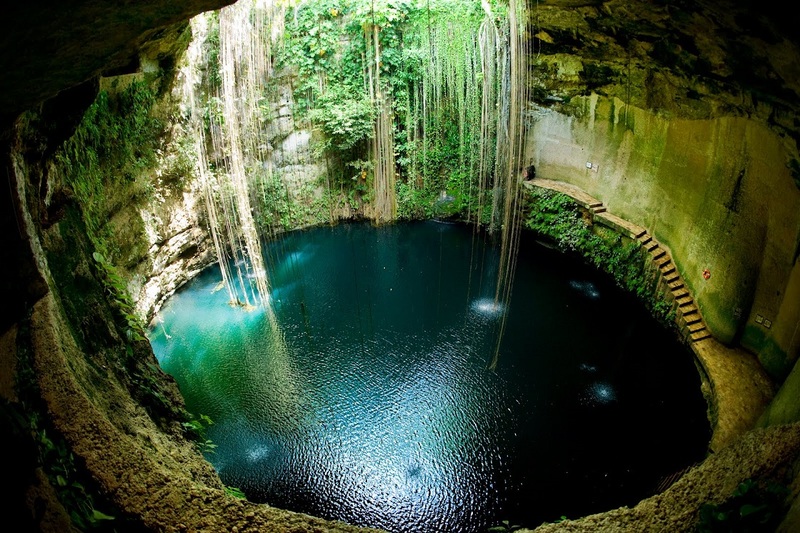 15 km North from Tulum, Dos Ojos Senote Park is located. 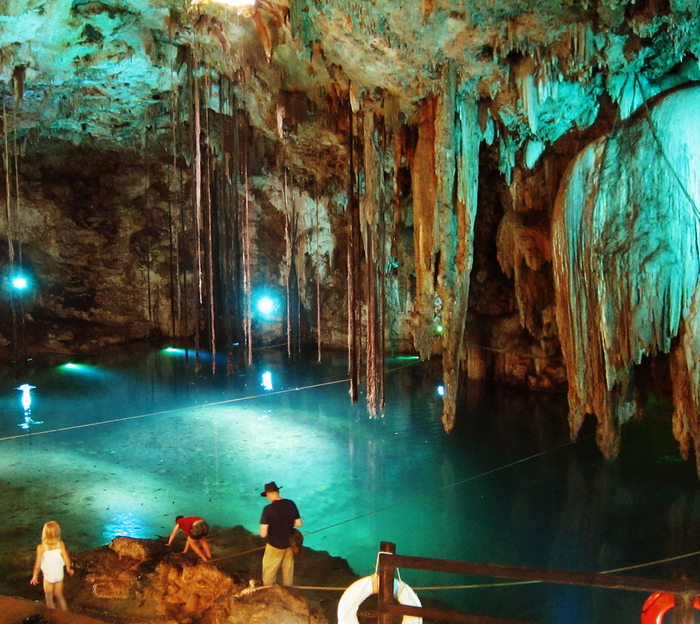 Main senote Dos Ojos is impressive semi submerged cave, but it is so many people there. There are dozen more senotes in this park, some are wild, but mostly are not. South of Tulum on the same road #307, Escondido senotes are located. There are some people on main senote located near parking lot. But if you will go farther on pedestrian path, you will have some senotes all for yourself only. West from Tulum, on road to Coba, you could find Gran senote. It is good, but also crowded. A little bit farther there is the senote with the strange name Car Wash, which is left in its natural condition. In spite of name, water is crystal clear there. There is excellent book on Yucatan senotes by Steve Gerrare "The senotes of the Riviera Maya". In my TN of 2004, I wrote: "Ocean shore between Cancun and Tulum is filled with lots of tourist attractions reminding me scaled down and cheap version of American Disney World". It is the same now, but they are not cheap anymore. The only public beaches at Tulum ruins and at Akumal are swarmed with crowds of people. 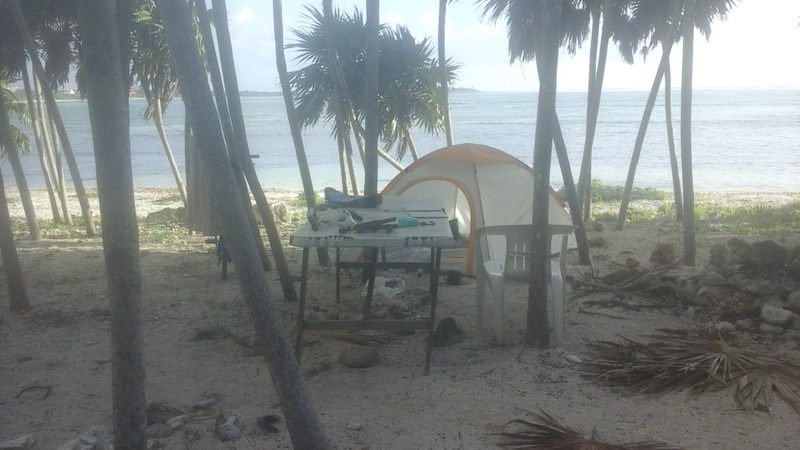 Amazingly, I found a place to put a tent on the shore, where I was alone on entire bay. This was at Soliman Bay, on property of Chamico's restaurant. They allow to park and camp on their property for 100 pesos ($5). I bought a tent and camped there for 4 days. Restaurant was never crowded, it is closed at 5pm, so I was there alone on entire shore. The reef is close to the shore, but most of corals are dead. However it is plenty of fish there. After Tulum I went to Merida and stayed at Art Apart hostel http://www.artaparthostel.com/ - quite an interesting place - hostel in the art gallery. 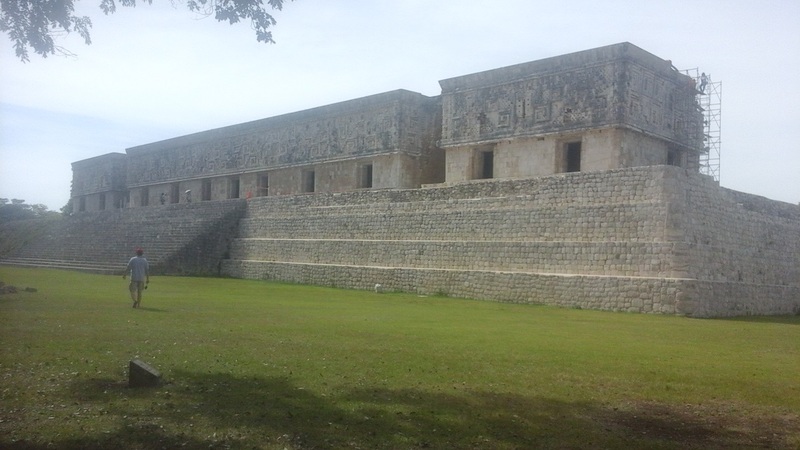 I rented a car and visited Mayan ruins on Puuc Road. I was there before, but every time it surprises me, how modern the style of these buildings looks like. They are about 1000 year old. 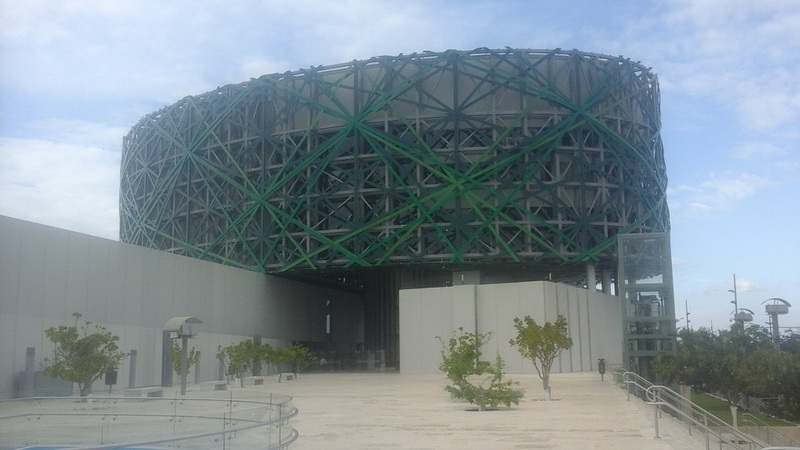 Also I visited new El Gran Museo del Mundo Maya, surprisingly politically correct museum. In order not to harm sensitivity of nowdays Mayan people, they eliminated all mentioning of bloody customs of ancient Maya. Museum building is one of the worst pieces of modern architecture. On my way back to Cozumel I stayed at Valladolid. 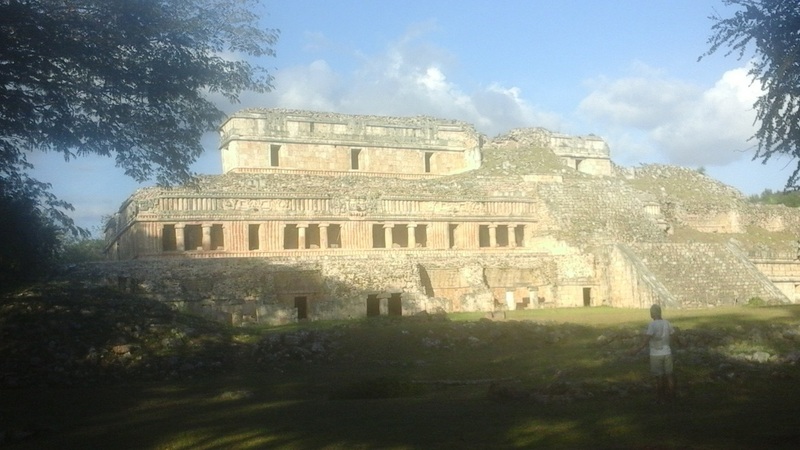 There are no Mayan ruins in Valladolid, but senotes are quite impressing. They are different than Tulum senotes. They are round pits with vertical walls. It looks like a monster with gigantic drill drilled hole to the center of Earth. Not surprisingly Maya thought that it is entrance into the Underworld. 15. 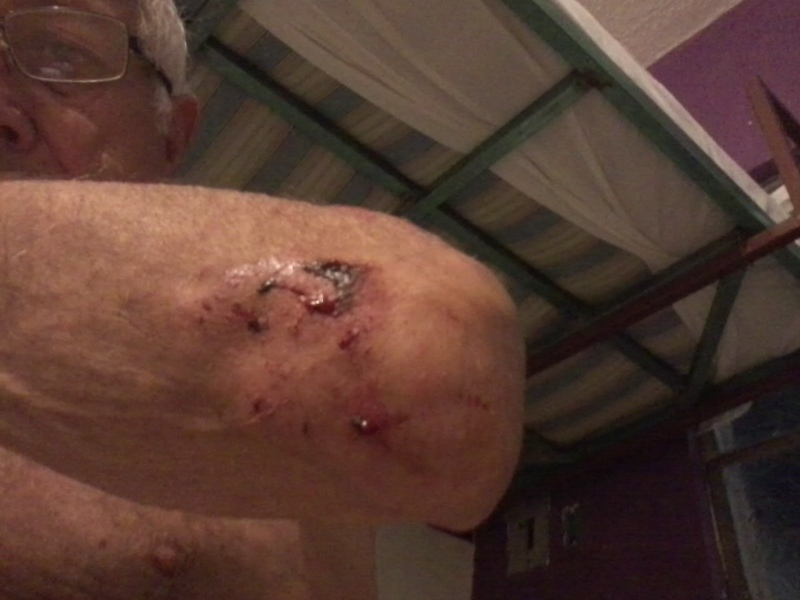 Fell down from bicycle.